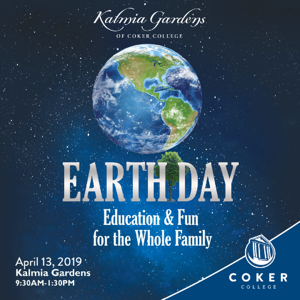 Coker College will host its annual Earth Day Festival on Saturday, April 13, from 9:30am to 1:30pm at Kalmia Gardens. The event, which is free and open to the public, will host activities for all ages including falconry, beekeeping, nature walks, a reptile collection, a plant sale, acoustic music with Jim Money, reggae music with Levi and Lucia Byrd., arts and crafts, games, as well as displays on sustainability, alternative energy, recycling, and environmental research. Bill Alexander, former chair of the biology department at the South Carolina Governor’s School for Science and Mathematics, will lead a bird watching walk at 9:30 a.m., and Fred Edinger, former geology professor at Coker College, will lead a geology and environmental walk at 11 a.m. (Participants are encouraged to bring binoculars.) Other attractions include yoga, reiki, food and drinks, and more. Kalmia Gardens will also host its annual Duck Cup fundraiser at 12pm. For a $5 donation, participants receive a ticket that corresponds to a numbered rubber duck that will “compete” in a race down Black Creek. Ticket-holders of winning rubber ducks will receive cash prizes: 1st place wins $150, 2nd place receives $100, and 3rd place receives $50. All proceeds from this fundraiser help support Kalmia Gardens. Established in 1935 and open to the public, Kalmia Gardens includes a historic house and a 35-acre botanical garden. The Thomas E. Hart House, built in 1820 with timber cut from the property, and surrounding gardens are on the National Register of Historic Places. Kalmia Gardens is part of the scenic South Carolina Cotton Trail and is the gateway to the 796-acre Segars-McKinnon Heritage Preserve. For more than 40 years, Earth Day, which is celebrated on April 22, has helped draw attention and resources to critical issues of environmental sustainability. Annually, more than one billion people in 190 countries participate in Earth Day activities, making it the largest secular civic event in the world. For more information about Earth Day, visit www.earthday.org. 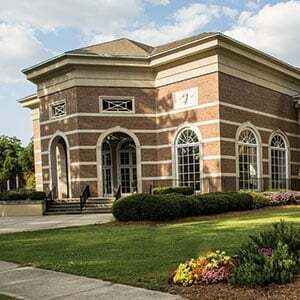 Kalmia Gardens of Coker College is located at 1624 West Carolina Avenue in Hartsville. For more information about Coker’s Earth Day Festival, call 843-383-8145 or email kalmia@coker.edu.